Perceptions vary widely when buying a house that needs work, just ask any home buyer. Better yet, ask a real estate agent, because many agents believe a house needs work if the house is not updated. Take a home built in the 1940s, back when kitchen counters were often covered in four-inch tile and not trendy stone or concrete. Maybe the cabinets are painted wood, and the floors are linoleum. A millennial buyer will say a home in that condition would need work. A purist who loves the character of 1940 homes might prefer its original condition and disagree. Whether a house needs work is based on personal opinion. Not everybody agrees on the condition of a home. Sometimes sellers will ask if they should fix up a home or sell it as is, and while certain repairs will bring more money, some types of improvements are better left as an option for the buyer. For example, if the wall-to-wall carpeting is worn and stained, it is generally a good idea to replace the flooring before selling. However, you would be foolish to haul a Wedgewood stove to the dump simply because it's a certain vintage. Since work is often in the eye of the beholder, let's talk about the types of houses that could use work. Further, how you would pursue a purchase offer will most likely depend on the category, the type of home you are buying that needs work. One thing you should not fall prey to is the tendency to wrongly presume that the listing price has not already been adjusted for the fact you are buying a home that needs work. Most sellers already realize the home needs work and have accounted for it when pricing the home. Sellers aren't interested in who is subsidizing a buyer's home improvement dreams. Yet that doesn't stop buyers from trying to discount an already discounted price. Fixer-Upper: The fixer-upper homes are generally priced for a sale in their AS IS condition. These homes often show deferred maintenance because the sellers were unable or unwilling to care for the home properly. Maybe there has been a death in the house, or it passed through probate to heirs who don't want it. In some cases, the exact condition might be unknown. To compute a price on the fixer-upper house, sellers will generally choose a sales price based on the comparable sales, and then they further reduce the price by the estimate for repairs. They might deduct a little bit more from the price for a fast sale. Whether it becomes a flipper house for an investor who is hoping to turn a fast buck or a home for a first-time home buyer depends on profit margins and the amount of work that is needed. If the home has been on the market for a while, with longer days on market than the average sale time of other homes, it could be the work that is needed exceeds the seller's expectations or it could be that the home appeals to a smaller pool of buyers. Don't make the mistake of automatically assuming longer days on market means the home is overpriced because that's not always a true assumption. Mint Condition Vintage: This type of home could sell at a premium, even though it is not necessarily modernized nor trendy. Think about Folk Victorians or Italianates or Queen Annes or Craftsman bungalows. Becoming increasingly popular are mid-century homes from the 1950s and 1960s architecture such as Eichlers or Strengs. To price these types of homes, a seller would probably add a premium price pad on top of the comparable sales. The owners might receive multiple offers, simply due to the attractiveness of the design and well-maintained interior and exterior. If the fixtures are original, the sales price could go even higher. If a perfect condition vintage home is on the market for longer than others around it, it is possible the home could be overpriced. Not every seller is eager to part with a home of such caliber. Some will price it high enough to make it worthwhile for the seller to relocate. The sellers may or may not budge on price. If a buyer wants the home badly enough, buyers will typically pay the asking price. 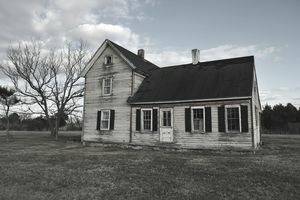 Newer but Outdated: You spot a lot of these types of homes in areas that were once thriving before becoming depressed. Maybe the area was overbuilt, and supply exceeded demand. Perhaps jobs left town. Or, another tract of homes opened up a few miles away for less money. Whatever the reason, owners often have little interest in remodeling a home just because trends change. After all, they figure the home was fine when they bought it, and it's fine to sell it now. What they don't realize is buyers don't want homes without updates. Buyers want turnkey homes, homes that don't require any work. If they have to put work into a home by tackling a home improvement project, they expect a discount. Remember the 1990s color trend of hunter green? Most horrible color ever. OK, maybe not, maybe the avocado green of the 1960s was the most horrible color. A few changes, such as replacing the fixtures, choosing modern paint colors, and installing newer appliances, are often enough to generate interest at a better sales price. Otherwise, buyers will generally not agree to pay top-of-market for an outdated home, even if it is newer. Foreclosure: Buyers often say they want to buy a foreclosure, which is a bank-owned home, but that's only because they don't have a firm handle on what that entails. Almost invariably they are sold in AS IS condition. Banks are not held responsible for disclosing facts they do not know. Also, unless a defect is discovered later, which turns out to be a major repair cost, banks are reluctant to offer discounts for work. Buyers might spot what are called pre-foreclosure houses on certain popular websites, but those are often not for sale at all and may never be for sale. Short Sale: The short sale house is perhaps the most misunderstood type of sale, especially when the house needs work. If a seller can't afford to make a mortgage payment, the seller probably can't afford to make repairs or fix up the home. Not only that, but the seller's lender has little incentive to cooperate with a short sale unless the price is in line with ​the market. Banks typically do not discount the price they will accept for a short sale home, even if the home needs work. The reasons for what might appear to you as a stubborn or clueless attitude among the banks vary. The bank could possibly be paid more to foreclose vs. short sale. In that event, the BPO value won't matter because the investor will be adamant on a net to match the foreclosure net. No amount of "explaining" to the bank the amount of work that is needed will make the investor budge. The Packrat: Not every messy house is a packrat house, but the packrat houses are the worst. These are the homes where you might need to navigate through on tight paths woven around stacks of personal belongings throughout the house. Sometimes the bedrooms are so full of furniture and boxes that you can't get the door open. Packrats collect and save stuff, and sometimes are attracted to odd things such as balls of lint or shredded newspapers. Combine a packrat house with years of neglect, and you could find piles of dead rodents, for example, or discover moisture problems that have led to a pest invasion. If you're lucky, renting a couple of 30-yard dumpsters will serve to get rid of the debris. But underlying problems that develop could be more extensive. Often, the sale prices of these homes are knocked down dramatically. Tip: As with any purchase offer, a home buyer's best bet is to rely on the comparable sales and then deduct for the work that is needed, based on actual estimates from licensed contractors. If that adjusted price lines up with the listed price, you might need to pay list price to buy a home that needs work. Homes for Sale Under Market Value: Too Good to Be True?